Occitanie, France, borders the Mediterranean sea and is home to some of the country’s nicest beaches. It borders Spain, and extends across a large swath of the south of France that includes Toulouse, Montpellier, Nîmes and Perpignan. And with 300 days of sunshine a year and a cultural history that stretches back centuries, Occitanie offers many of the same pleasures as Provence — but without the crowds of tourists and inflated prices. Even though this region of France is relatively underappreciated internationally, Occitanie has a rich culinary repertoire: seafood delicacies from its coastal Mediterranean towns, cheeses and meats from its more mountainous inland. The region is also France’s largest — and often ignored — wine producer. Recurring herbs such as thyme and rosemary create harmony in Occitanie’s varied cuisine. Occitanie stands out for the diversity of its geography and culinary specialties. It’s the perfect slow-paced summer destination to soak in the sunshine, discover delicious new foods and meet people who are as warm and welcoming as the dishes they cook. Here are some of Occitanie’s best-kept culinary secrets and the stories behind them. Cassoulet is a specialty from Castelnaudary, a city in Languedoc. Legend has it that this white bean and meat stew was first made during the Hundred Years War. While the town was under siege by the English, the starved townsfolk put all of their remaining food into a single stew: various meats, lard, pork and white beans went into the pot. The stew energized the townsfolk and gave their soldiers the strength to beat back the English and free their town. Despite the enduring appeal of this story, white beans came to Europe from the Americas long after the 100 Years War, in the 16th century at the earliest, so the original recipe probably included fava beans instead. But whether or not this origin story is true, the city of Castelnaudary still claims the title of world capital of cassoulet, and the dish remains popular and available today in many cities throughout the south. In Occitan, the language that gave Occitanie its name, escoubilles literally means garbage, or leftovers. And that was originally the way this recipe was made: families would cook the week’s leftovers into a big Sunday stew. But the resulting ragout was anything but trash — with carrots, mushrooms, green olives, potatoes and meats that include veal, sausages, and gizzards in some variations, the resulting dish is perfect for chillier winter nights. It can be tricky to find Ragout d’Escoubilles outside of small villages, but a few restaurants do serve this traditional dish. Tielle, also called Tielle à la Sétoise, is a savory octopus and tomato pie from the port city of Sète. The recipe for Tielle includes black olives, white wine, thyme and olive oil. The story goes that the Tielle was brought to Sète, a fishing town that borders the Étang de Thau, by Italian fishermen in the 1800s, and spread from there across Occitanie. If you visit Sete, I also recommend trying the moules farcies (stuffed mussels), another local specialty. What French meal would be complete without its accompanying cheese? Enter Occitanie’s original blue cheese, Roquefort. Produced in the hilly region of Aveyron, Roquefort has been around since at least the 11th century. 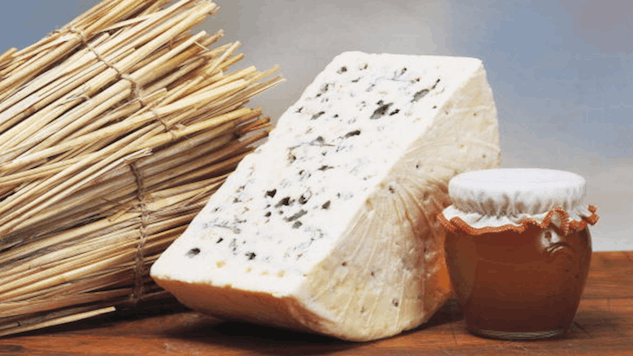 It is produced with raw sheep’s milk that is intentionally contaminated by a fungus, the penicillium roqueforti, and left to mature in temperature-controlled caves to become blue cheese. The story goes that the first roquefort was made when a shepherd went into a cave to shelter from the rain and forgot his lunch of bread and sheep’s cheese. When he returned to the cave weeks later, he discovered that the fungus that had grown on the cheese made it tastier than before, and Roquefort was born. If you’re a true Roquefort fan, you can even take a tour of the caves where the cheese is produced. With its spiky exterior and conical shape, the gateau a la broche — literally cake on a stick — looks like a doughy Christmas tree. This cake is common in the mountainous Massif Central; to cook it, dough is poured slowly on a rotating spit over a fire. Historically the cake was cooked in the chimney, and the spit was turned by hand. You can also find this type of spitted cake in other parts of Europe, such as Germany and Hungary, though the toppings and ingredients used vary by region.